The 2017 Wellesley Turkey Trot is SOLD OUT. Please register before the end of October next year, so you don't get closed out. There are Turkey Trots in Newton and Dedham on Thanksgiving Day. Bank of America is proud to present the Wellesley Turkey Trot, a wonderful start to Thanksgiving day. The Wellesley Turkey Trot Foundation is in the process of selecting this year's race beneficiaries. SPECIAL RAFFLE PRIZES FOR ANYONE MAKING AN ADDITIONAL TAX DEDUCTIBLE DONATION TO WELLESLEY TURKEY TROT FOUNDATION DURING THE REGISTRATION PROCESS. THESE RUNNERS WILL BE ENTERED IN A SPECIAL RAFFLE! •	Fastest team: a team must have a minimum of 3 runners, including 1 female. Prizes include gift certificates for Marathon Sports, Bocado Restaurant, Oofos recovery wear, and pint glasses. We will also have a raffle with fabulous prizes donated by local businesses and prizes for top fundraisers. The Kids Fun Run registration is $15 and limited to 200 participants. The Kids Fun Run is less than 1 mile in distance and ONLY for children 10 and under. Kids will receive a chocolate turkey lollipop and a finisher's ribbon. It will start at 8:45 in the back of the parking lot near CVS. It is only for children 10 years old and younger. Children over 10 who would like to run should register for the 5k. Only parents with children under the age of 5 will be permitted to run with their children. 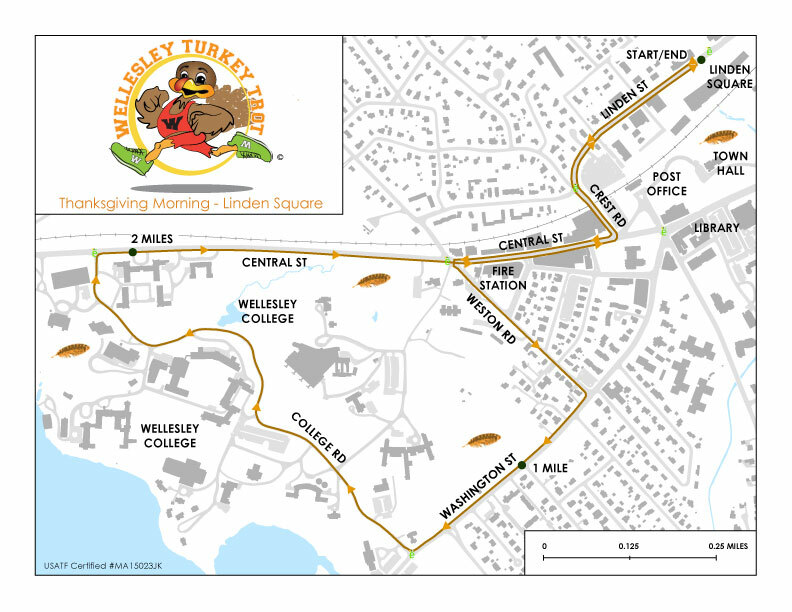 The turkey trot is a USATF Certified 5k run through scenic Wellesley. The start and finish are at Linden Square on Linden Street. Runners will follow Linden Street to Crest Road where they will turn left before turning right on Central Street. The runners will follow Central Street to the firehouse and turn left on Weston Road until they reach Washington Street. From there, they will turn right on Washington Street until scenic College Road, the entrance to Wellesley College Campus. Runners will follow College Road up for approximately ¾ of a mile before turning right on Route 135 (Central Street) and there they will run past the famous Boston marathon scream tunnel. The runners will follow Central Street to Crest road where they will turn left and then an immediate right on Linden Street to the finish line. There is plenty of parking on Linden Street and we encourage families that live close by to walk over. PICK UP EARLY IN THE WEEK FOR BEST SELECTION OF SHIRT SIZES. If you wait until Wednesday afternoon, we will have limited size selections in shirts. NOTE: THERE WILL BE NO RACE DAY NUMBER PICK UP. You may pick up race numbers for friends and family. WAIVER: I will NOT bring my DOG to run in the race. I know that running a road race is a potentially hazardous activity. I should not enter and run unless I am medically able and properly trained. I agree to abide by any decision of a race official relative to my ability to safely complete the run. I assume all risks associated with running in this event including, but not limited to: falls, contact with other participants, the effects of the weather, including cold, snow and/or ice, high heat and/or humidity, traffic and the conditions of the road, all such risks being known and appreciated by me. Having read this waiver and knowing these facts and in consideration of your accepting my entry, I, for myself and anyone entitled to act on my behalf, waive and release The Wellesley Turkey Trot, its directors, officers, and staff, Wellesley College, the town of Wellesley, MA, and its employees, and all sponsors , their representatives and successors from all claims or liabilities of any kind arising out of my participation in this event even though that liability may arise out of negligence or carelessness on the part of the persons named in this waiver. I grant permission to all of the foregoing to use any photographs, motion pictures, recordings or any other record of this event for any legitimate purpose. I understand that headsets of any kind, DOGS, DOGS on leashes, DOGS in vests, in-line skates, bicycles and strollers to transport children are prohibited and that violation of this prohibition may result in disqualification and removal from the race. If you're under 18, this waiver should be signed by a parent/guardian. I understand there is NO RACE DAY NUMBER PICK UP! I also understand that there is a strict no refund policy as race proceeds go to charity.